This one really stretched me cos I have never given or received a valentines gift or card!! My hubby and I have just never bothered - the last of the great romantics hey (NOT!!). So, when he is presented with this on the 14th, he is going to dash straight outside to check where I've bashed the car lol. I'll try and have the camera ready to take a pic of his face - should be priceless!! Anyhoo, on to my project. I'd been mulling this over for weeks and whilst wandering around Hobbycraft last week I happened upon some four sided cone baskets made from wire to hold flowers in. Ah ha! I had a eureka moment (don't get these very often you know!!) and came home to make one like that. Well, one thing led to another and I landed up with a heart shaped gift bag to put some choccies in. Stamp the image and sentiment out with Versamark ink and heat emboss with Fine Detail Gold Embossing powder, colour the heart and carefully cut it out (going too close to the embossing can cause it to chip). Adhere this to a small circle and layer on to a red scalloped circle. Cut the sentiment into a rectangle, punch two semi circles on either short end and adhere to a scrap of red card. Punch out two semi circles again to give the effect of a ticket. Adhere the designed paper hearts to the large scalloped hearts. Apply strong tape along the four tabs on the gusset. Place one heart face down and adhere the gusset to the heart, making sure the V point is aligned with the bottom of the heart. Carefully adhere the second heart in place, again checking the alignment. Me being the fuss pot that I am I wanted to carry the gold from the embossing through the design so I used some very fine cord (1mm) and ran it around the edge of the inner heart using tacky glue. It's probably better to do this before attaching the hearts to the gusset (not like me who does everything back to front!!) 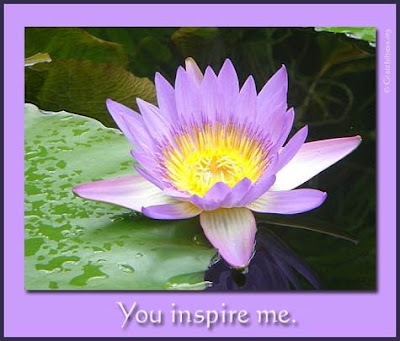 Adhere the image to both hearts. I also ran a line of gold cord along the centre of the handle, then attached this to the inside of the gusset with strong tape. That's it - job done! 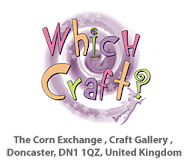 Pop over to the Whiff of Joy site to check out the other fab projects by the DT. 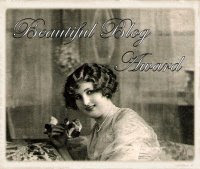 Katharina has given us a bit of candy to pass on to all you lovely Whiff of Joy fans. I have Henry Celebrating Mouse to give away and as I'm in such a pink mode lately I've added some pink jewels, pink and cream raffia ribbon, sparkly pink flowers and some pink heart brads. 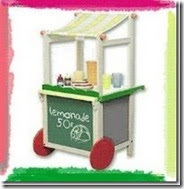 All you need to do is link my candy on your blog and leave a comment here when you have done so. I will draw the winner using a random generator on Sunday, 1st February. 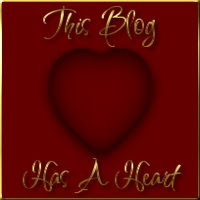 I will post worldwide and this is open to ALL, so if you don't have a blog leave a comment on this post, if you're leaving an anonymous comment please make sure you state your name in the comment. Check back on the 1st to see if you've been lucky! Everyone seems to be in love lol. This Valentines card is for three challanges - A Spoonful of Sugar and Cute Card Thursday which are on a love theme and I've used this week's Ismaki sketch, although I've tweaked the sketch a little to fit in with the sentiment stamp that I used. 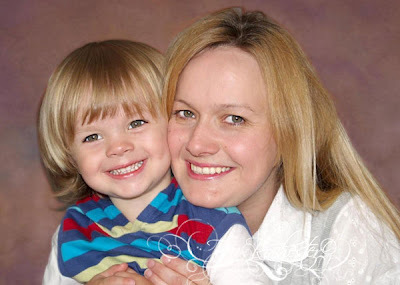 Wow, have you seen the fab sketch over at Mojo Monday, I really loved working with it. I've kept it pretty simple - not a charm in sight. Yes, I'm still in the pink lol so went with all pink on this card. I stamped scrolls on the pale pink paper with chalk ink to break the plainness. I carried the mouse theme through to the inside with this cute little mouse - ain't he just the sweetest!! The scroll stamp is from a freebie off Cardmaking and Papercraft magazine - I only bought the mag for the stamps (as you do) lol. This week's challenge on Whiff of Joy is to make a Valentines card so I dug out the heart template that I made yonks ago and did another heart shaped card. I love this image and think she is just perfect for a Valentines card. I went with the traditional reds and golds (cos I'm an old fogey lol). I don't know why the ribbon looks so orange in the pic, IRL it's almost the same colour as the gold card that I used - bizarre. I made the flower by punching out flower with the Retro Flower punch and then added a layer of organza pull-flowers. I added a rose to the center for a bit of colour. I've not decorated the inside of this card yet - ran out of time ... again *roll eyes* but will get round to it - I ain't breaking the only resolution I have ever made quite so early in the year lol. 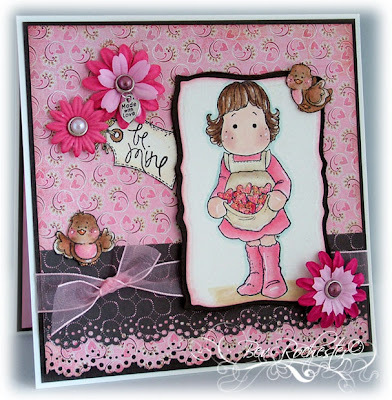 Melinda blowing kisses by Whiff of Joy has been coloured with distress inks and Twinkling H2O's. The rose paper is by Paper Pizzazz and it's a sheet I have had for about 4 years. 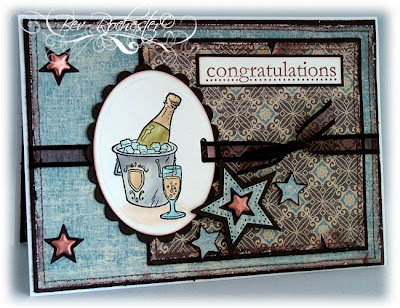 The sentiment is from Circle of Friends set by Stampin Up. Dawny has done another fab sketch on PTW this week and as soon as I saw it I had to make a card lol. The only problem was deciding which papers to use - I think it takes me longer to chose the papers than it does to plan and make the card and I'm sure I'm not alone here lol. I've not used this Melinda for a while and this she is just the sweetest little lady. The inside I have left simple and blank as I had a special person in mind when I made this card so will fill the inside with my scrawl no bother!! The papers are from a HOTP kit off QVC - yes I am still using them!! That's it - a really quick and easy card to make. I can't believe I have had this stamp for ages and have never inked her up till today! I just wish there was an extra 24 hours in every day lol. 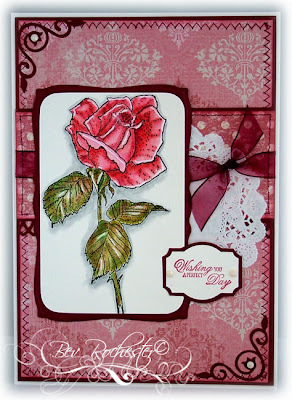 I've done this card for this weeks Sketch Saturday challenge and yes, another amazing sketch by the very talented Jo. I've gone with Basic Grey Granola papers. The flowers I made by stamping the sold stamp from Stampin Up Delight in Life set in Jumbo Java chalk ink on to the mustard BG paper, then I used the small Retro Flower punch to punch it out - it's about as close as I am going to get to the Stempelglede stamps as they are no longer being sold by the lady that designs and makes them and I have been unseccessful in getting a reply from the shops that do stock them :( - still I think it's quite effective if I do say so myself lol. The sentiment on the front is a Scrappy Cat stamp which I have stamped on to a Spellbinders Label die. 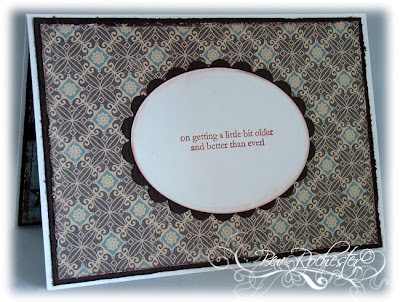 The scalloped border is punched with another of my treasured Martha Stewart punches. On the inside, I stamped the solid and outline flower from the Delight in life set on to the mustard paper, cut it out and used some Beadazzles in the center. I also stamped the outline stamp on the opposite side with Jumbo Jave ink. The sentiment is from Elzybells. 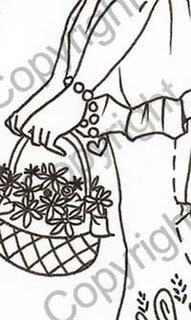 This weeks challenge is to use two stamps, either two Magnolia's or two Stampavie's or one of each as long as you have two different images on. Now me being me I had to get totally carried away lol and ended up using four Magnolia stamps - Tilda, the two birds and the little tag. I know you don't get pink birds but as I'm in a PINK mode, everything is pink including those poor little birds lol. I have used the scrummy Basic Grey Bittersweet papers and gone yet again for the pink and brown combo (boring I know but I'm loving this combo at the mo) The sentiment is from a Studio G set. I love these new Nesties but find them sadly lacking in decent sizes for layering. There is such a huge difference in size between each nestie that I decided to cut down the brown layer so it didn't overwhelm the card. (I've been spoiled by the first ones that came out and had such a good selection of sizes in the sets of four). I attached the charm to the top flower with jump rings after seeing Kim do it on her cards - I love the idea!! 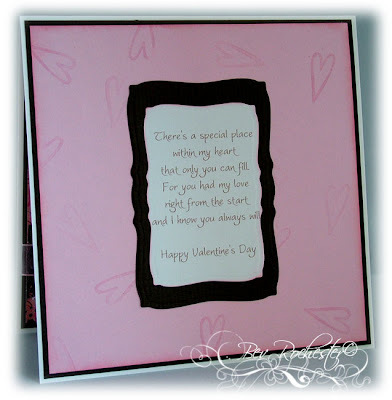 I used a heart from the same Studio G set and stamped on the pink layer on the inside of the card with chalk ink. The verse is computer generated, courtesy of Imag-e-nation who have some fab free verses. 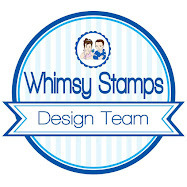 A quick post on the Whiff of Joy Spring Club kit AND .... another sneak peek!! Just to remind you that there is only 2 days left to pre-order the Whiff of Joy Spring Club kit, orders close on the 26th January and if you miss out you will be gutted, honest!!! Now doesn't this look yummy!!! I l ove the Party Animals set of stamps by Whiff of Joy - they have been so useful for making those dreaded men's cards that I find so difficult (and I'm getting to all the male orientated papers that seemed such a good buy at the time - you know the one's don't you lol). 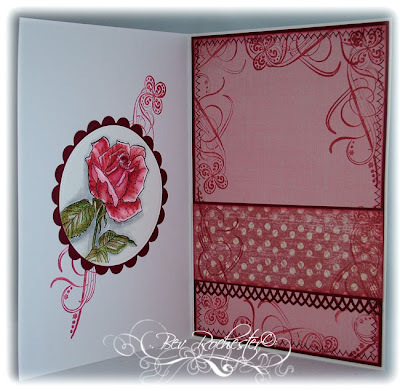 I'm entering this card in this weeks Friday Sketchers challenge, it's a fab sketch by Bea. I really loved working with it especially as it's the second non-square card I have made in a week!! I'm beginning to like these lol. Surprise surprise - not! I've gone with a blue and brown colour combo again. The stars are cut with a Sizzix die although I had to trim the blue layer down as it was too big for the layers I wanted to build. The copper brads were orginally teal, I heat embossed them withcopper embossing powder (only cos I didn't have brown - but like the subdued bling the copper gives). I've been tagged by Sandra. 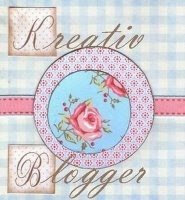 If you've not visited her blog pop on over, she has the most fantastic ideas and makes such amazing cards - so inspirational. Okay I broke down and did a combo again - but I've not done one for a while lol. I'm entering this card in 3 challenges - Papertake Weekly which is to use 3 shapes on your card (rectangle, circle, heart); Charisma Cards challenge is love - isn't Millie just the cutest Valentine and Secret Crafter Saturday Challenge which is Hearts. 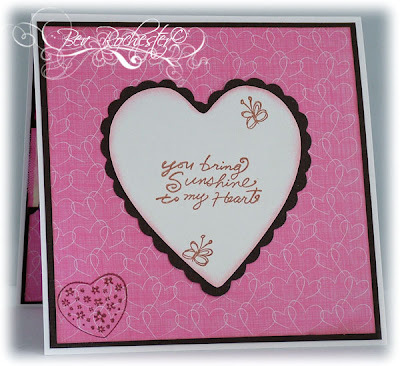 I have used the adorable Tulip Heart Millie from Pink Gem Designs which I have coloured with distress inks and H20's. For the scalloped heart all I did was stamp the image again, draw around it on to brown card, mark it 1/4" bigger all the way round with a pencil and starting at the bottom cut the scallops with a pair of scissors. It works a treat and fitted perfectly. I have used the new Papermania Scrumptious pad and scrumptious it is lol. A Stampin Up Photo corner punch was used for the two corners, a few Prima flowers and some punched with a Retro Flower Punch and run through the Cuttlebug to emboss. I also used Bazzill Tulle Ribbon to finish it off. The sentiment is from Cuddly Buddly. The inside is pretty simple, I repeated the heart as for the front and used a sentiment from a Scrappy Cat set from Hobbycrafts. I also used the heart and butterflies from the same set. And not a "cute" image in sight lol. When I saw this week's Mojo Monday sketch I knew exactly what I was going to do, especially after seeing Chris's amazing card that she made with her new digi-stamps. Now when I started this card Chris did not have her digi stamps uploaded for sale, and me being the impatient madam I am, I dug out one of my very dusty and sadly neglected rose stamps. I forgot just how much I love this style of card and stamping - I can't remember when last I did a card like this. Watch this space cos I'm definitely going to be using more of my floral stamps, as well as some of Chris's new floral digi stamps. If you haven't seen them yet pop over and take a peek. They are fantastic. Okay back to the card. I had to go for a large card as the image is huge. The size of the stamp is 5 1/2 x 3 3/4" and there was no way it was going to fit on a square card. I used these gorgeous K & Co papers that I got for Christmas from my fab mate Karen. I used only one of the Nesties as matting two sizes would have overwhelmed the card, so I just trimmed the image and rounded the corners and I think it fits quite nicely on the nestie shape. For the inside I stamped the image again and cropped it down with a round nestie. Another MS punch got an airing this time, and I've stamped scrolls with Versamagic Red Brick ink. Co-Motion Rose coloured with distress inks and H2O's. The sentiment on the front is from Whiff of Joy. The swirl stamp is from a HOTP clear set. 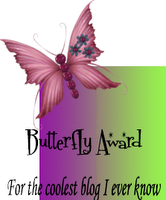 I received this award from Michelle, thanks so much sweetie. I've already passed this one on so if you have not had it please help yourself lol. And this one from Lyndsey and Sue, thanks for thinking of me sweeties. I've also passed this one on already. Oh my goodness - go check out this candy!!! Whiff of Joy release party on now! !